2. Promo runs from January 25, 2019 to December 31, 2019. Chevrolet Makati - 10% OFF on regular Preventive Maintenance Services. purchase of P15,000 on Car Services. 4. 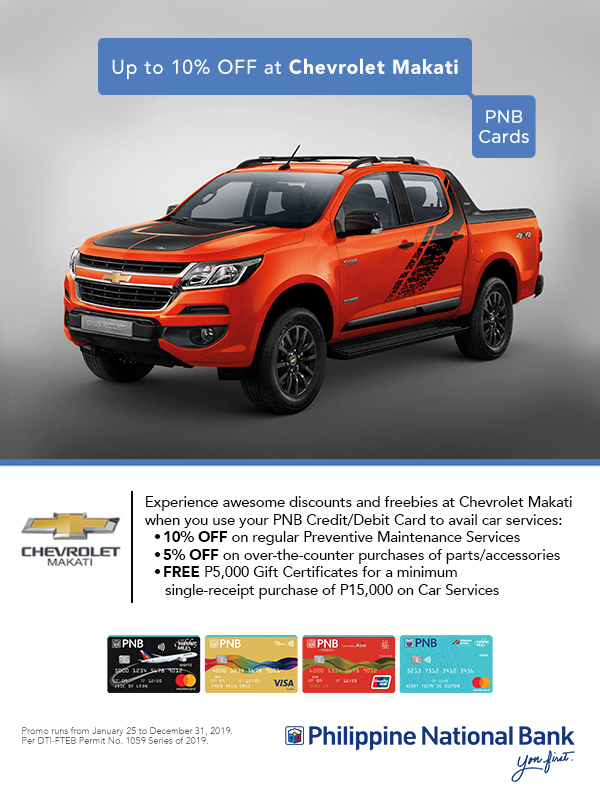 Promo can only be availed at Chevrolet Makati - 2282 Pasong Tamo Extension, Makati City. For inquiries, you may call (02) 817 1888. 5. To avail of the promo, the Cardholder must charge the total amount of the bill to his/her PNB card in a single-receipt transaction. 6. Offers are not convertible to cash. 7. The offer cannot be exchanged for other items or discounts and cannot be used in conjunction with other promotional offers by the partner merchant. 8. The Terms and Conditions governing issuance and use of PNB Credit/Debit Cards are incorporated herein by reference and made an integral part hereof. Per DTI-FTEB Permit No. 1059 Series of 2019.